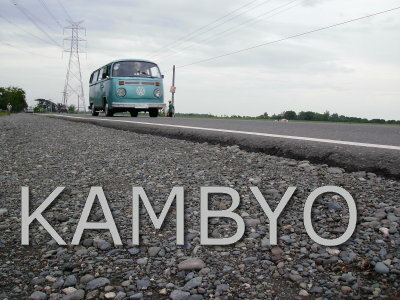 I wrote the screenplay of “Kambyo” as a requirement from my producer (Viva) to make a follow up film after the commercial success of “Ang Lihim ni Antonio” (Antonio’s Secret) and “Ang Lalake sa Parola” (The Man in the Lighthouse). I wrote this film during my stay in Sagada (Mountain Province). And our vision for this project was to come up with a light, fun and entertaining film for the Filipino gay community. I think “Kambyo” is my most accessible and my most “mainstream” work so far. From the makers of “Ang Lihim ni Antonio” (Antonio’s Secret) comes a heartwarming story of four men, their friendship and a road trip that will change their lives forever. It’s the last summer of their university life. Cousins Macky (Rayan Dulay, Bathhouse) and Manuel (Kenjie Garcia, Ang Lihim ni Antonio) start on a road trip to look for the Macky’s long lost friend Philip (Johnron Tanada). They bring along with them their fun loving friend Xavier (Harold Macasero), who tags along a hunky guy named Aldo (Gabz del Rosario), whom he just met right before their trip. As the engine of Macky’s old van begins to accelerate, their relationships start on a new journey. Love blooms. Secrets unfold. Insecurities collide. And hidden desires set in. As they drive their way up north of Manila, this unrestrained group of three friends and a stranger explore the boundaries of their friendships, their sexualities, their dreams and the future that lies ahead of them. Bakit ka patuloy pa sa paghinga? This is one of the breaks within the tiring three day shoot of “Ang Lihim ni Antonio/ Antonio’s Secret” in Marikina city. The shoot is especially memorable for Kenji Garcia who is doing his very first work as an actor in this film. And to make things worse, his very first scene on the first shooting day was the masturbation scene of his character Antonio! I remember the whole set was quietly tensed during that first scene. Luckily, critics (Business Mirror and Pinoy Entertainment Portal) have praised the work of Kenji in this film. His bold move was probably well worth it. He walked inside the audition room nervous and without any pretensions. As the writer of the film project “Ang Lalake sa Parola/ The Man in the Lighthouse”, I was not able to see the star in him quickly. He seemed to be your ordinary bikini contestant.